Reserved for delivering content under 2MB, such as ringtones and wallpaper, directly to the users device. Mobile downloads can be triggered from a 2D barcode or from a link in a mobile landing page. Both options are direct to content. All mobile downloads can be tracked. Full analytics are available. 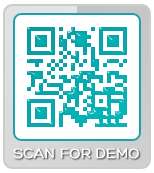 Scan the code to download a free ringtone. Social Media, Image Galleries, Audio.